This post is a brief reminder of my experience with Justhost shared hosting. It is primarily intended for personal use/reminder – since the hosting package I used does no longer exist as such. Take it for what it is. I will place some affiliate links for listed/recommended products.I’m listing them because I really think they are good – but, of course, you can do your own research and choose for yourself. With a friend I set up several websites on that hosting – bikegremlin was the most “active” of the lot. Most (but not all) were just experimantal – with almost no visits. At the time, Ehost and Justhost were already owned by EIG company and if you like you can read abut EIG reputation. January of 2018. About a year later, EIG shuts down Ehost and transfers all the users to Justhost. So I’ve instantly become a Justhost client with the same package (until the expiry of the paid hosting service). 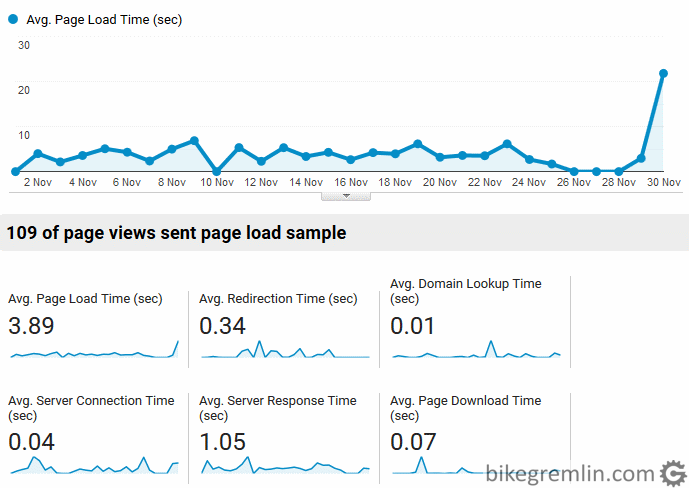 My website did need the optimizations – not even the best hosting in the world can (easily) compensate for a poor optimization. After having done all the optimizations, 500 errors and downtime were practically eliminated. 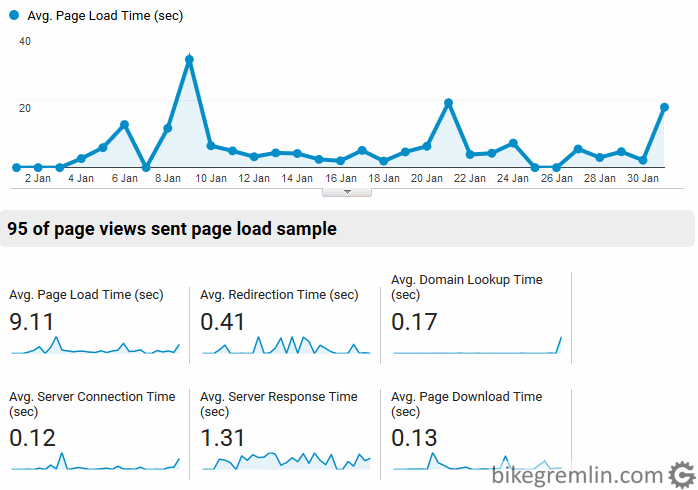 Page load speeds were not bad, but not stellar (bikegremlin is the only website on my shared hosting account that has any significant traffic). July of 2018. I am gathering information about a good host to switch to, that would be good for the next year or two (at least). Details in chapter 5. I also realize that I should optimize my website(s), since even a better and more expensive hosting won’t help if the website isn’t properly built. February of 2019. I’m switching to Veerotech hosting (affiliate link), where I took a package: “SSD VR-10 Reseller”, for 12$ per month. Before I started measuring uptime, there were two downtimes that lasted for several hours – at least those that I know of. This happened right after the acquisition of Ehost by Justhost (probably took some time to sort all the servers and systems out). After that, uptime was mostly OK.
Average page load time for January of 2018: 11.02 seconds. August: 6.34 – this is when I started with website optimization. Only the following results are fair/comparable. November: 3.89 – permalink structure change. January: 9.11 – that did it – I decided to change hosting before the spring. Total average page load time since most of the optimizations have been done (August): 5.91 seconds. Load Impact test for the hosting makes the website stop working (500 error) with as little as 20 simultaneous “Virtual Users”. 50 users is the test standard and any decent host can deal with this without hickups. I didn’t use technical support even once. A friend, whom I share the hosting with (he’s the smart one: who knows PHP – I just type 🙂 ), had some projects and had the pleasure. From what he said (and what I remembered): chat support does all they can to help you. Sometimes it takes a bit longer to explain what you need, but they do what they can to help you, not giving up. My general impression is OK: apart from the above mentioned “hick-ups”, it basically all worked – just too slow. Important thing: there were no hacking attacks, viruses, data loss, blocked IP, or e-mail addresses. This is very important in my opinion and it is only fair to praise Justhost for getting that right (not every host does). Shortly put: it’s not as bad as the numbers show, but worth only with a 3-4 $ monthly subscription (not having to pay for more months in advance, so you can leave when the website “outgrows” this hosting). However, for any website with more than a few visits, this hosting doesn’t cut it. I think the main problem is poor server performance. Would I recommend this hosting? No. At regular price – you can get better hosting for the money. While discount is big only if you pay for 3 years in advance. This is too long for any hosting. Service quality can change – either because of an owner change, or a change in business policy. So paying for a year in advance is risky, two years even more so, while for 3 years I wouldn’t “trust” any host I’ve heard of. For example: I left this host with almost a full year left of what was paid for (for full disclosure – there still are a few no-visitor sites spinning, but it’s just until it’s figured out what will happen to them). bikegremlin.com (Serbocroatian website version) has about 1,000 daily visitors, mostly from former Yugoslavia (Central Europe). bike.bikegremlin.com (English version) is set up as a completely separate website, with a separate WordPress installation (just shares the domain) and has about 2,000 daily visits, mostly from the USA. I have several small websites with almost no visits, but there is a chance that some of them will be more seriously developed in the near future. For a new website project I need a place where I can put it to be on-line and work, until the number of visitors becomes so great that it needs a separate hosting. Update 27th February 2019 – a separate post offers my hosting recommendations. How to compare and analyze hosting offers: Web Hosting offer catches (small print). I’m also planning to test a few promising hosting providers, but more on that after the tests are finished (first has already started). First of those: Veerotech hosting review.